Material relating to James H. Lane. Lane served as president of the Topeka and Leavenworth constitutional conventions and was elected one of the state's first U.S. senators. He raised the "Frontier Guard," recruited and commanded "Lane's Brigade" (the Third, Fourth, and Fifth Kansas Volunteers), and was responsible for forming the First Kansas Colored Volunteers, the first regiment of African American troops to see action on the side of the Union during the Civil War. Included in this material is an order from the War Department accepting the resignation of James H. Lane as recruiting commissioner, several certificates acknowledging Lane's service in the Third and Fifth Regiments of the Indiana Volunteers, and his appointments to the district courts of the state of Kansas. 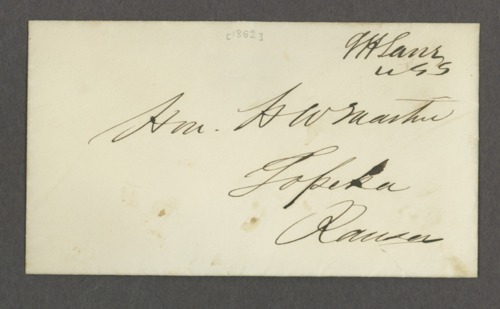 Several letters written by Lane are also included. Collections - Manuscript - Miscellaneous - Misc. : La - Lane, James H.